Is this a Tekken or Fearless? I believe it is the first of its kind. Maybe we will get lucky and see a picture or video of this new creature it its natural element. OK. So the frame is a Tekken frame with upper Sea Devil and lower Fearless appliques and Tekken eyes. Anyway, the kite looks cool. I would call it Tekken Fearless Devil. Lam and I had many discussions on the subject of what to call it, and we settled on "Tekken Devil" or Tek Devil. 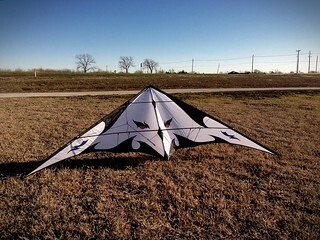 IMHO, that is the best looking kite by Lam I've seen yet and you guys post a lot of pictures of Lams kites. Crisp contrast between the black curves and white sail. Just enough elements of color to complement. Truly beautiful piece of art and we haven't even seen it fly yet. Man!, I wish you hadn't used the 'secret password' to my kite/bank account. I've been flying the Tekken vent alot lately - my new favorite vent (and thats among some very very fine vents). Yours is for high winds? I realize George Orwell's 1984 Newspeak was not real. or is there more than one model buried in there? Let me do a "doublethink" on that. Very nice looking! A nice alternative to the 'original' Tekken with the larger Sabers in the kite shoulders, IMHO! I would like to see the vent position. My midvent has got quite a lot of holes already.